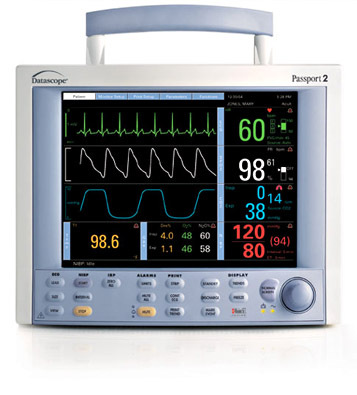 We have the lowest prices on ETCO2 Datascope Passport II monitors! Download Document of Datascope Passport II Patient monitor w/ CO2. Get a great deal on a fully featured Datascope Passport 2 Anesthesia Monitor with optional Sidestream Co2! The Datascope Passport 2 makes monitoring simple. Rather than rummaging through layers of menus, there's a Navigator knob. For frequently used functions, there are quick-action keys. Three waveforms will automatically reconfigure to six when needed. Colorful numerics automatically re-adjust to maximum size for optimal display visibility. Be amazed at what a difference a truly intelligent interface will make. Who would have thought it possible? A monitor that actually provides more while requiring less. This is a refurbished Datascope Passport II Patient Monitorin excellent condition with a 1 yr warranty. Just what our practice was looking for. Thank you D.C.